Pandora – The World of Avatar at Disney World's Animal Kingdom is packed with things to see and experience. Like Cars Land at Disney California Adventure and the Wizarding World of Harry Potter at the Universal parks, it is a meticulously crafted and highly immersive land based on a single intellectual property—in this case James Cameron's “Avatar” movies. (To date, only one Avatar film has been released, but there are plans for a series of sequels.) And like Cars Land and the Harry Potter worlds, Pandora is hugely popular. To best enjoy your visit, it would make sense to learn about its features and determine how you might want to experience them before you go. Let's count down the best things to do and see at the land, including some under-the-radar things to discover. The highlight of Pandora, Avatar Flight of Passage is a thrilling ride (but not so thrilling that all but the wimpiest visitors couldn't handle it) that takes the “flying theater” concept Disney pioneered for Soarin' to the next level. Set many years after the human-Na'vi conflict at the center of the Avatar movies, the people of Earth are now welcome to visit Pandora and learn about the customs of its indigenous people. That includes flying on the back of a winged banshee, a rite of passage for Na'vi teens. As in the movie, guests “link” with an avatar for the experience. They board unique ride vehicles that not only simulate flying but allow passengers to feel the banshees’ diaphragms expand and contract as they breathe. The utterly convincing and transporting E-Ticket attraction is one of Disney World's best rides. Because it is so popular, Avatar Flight of Passage’s standby lines can be very long. It is virtually a necessity to make an advance reservation using Disney World's FastPass+ system. As one of the resort’s most in-demand experiences, the ride’s FastPass+ reservations typically are not available within two weeks of a visit. Make sure you book a reservation at the earliest possible time. Pandora's second attraction is the tonal opposite of Avatar Flight of Passage. Instead of thrills, Na’vi River Journey is a gentle, almost meditative boat ride through a Pandoran jungle. Passengers can see Na’vi tribespeople and creatures such as viperwolves. 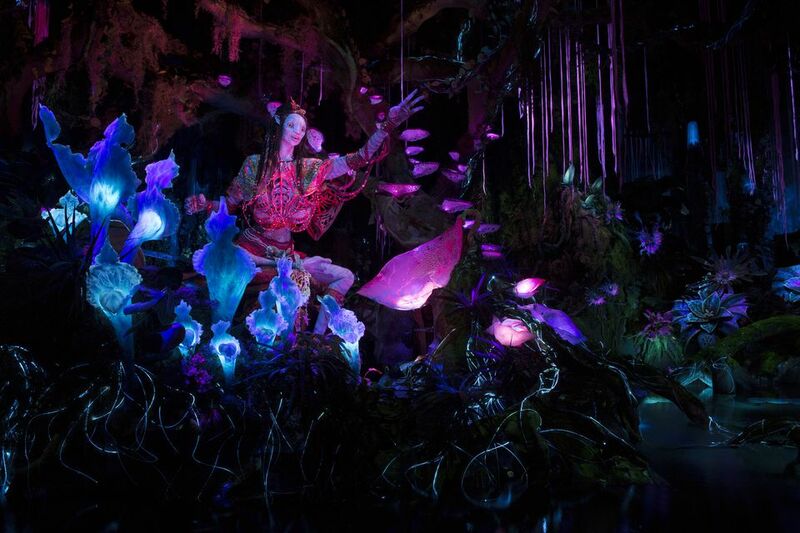 The attraction features the Shaman of Songs, a 10-foot-tall character that is disarmingly lifelike and among Disney Imagineering’s best animatronics. As with Flight of Passage, Na’vi River Journey is quite popular (although not as high-demand as the flying Banshee ride), and FastPass+ reservations should be made as early as possible. Guests enter Pandora, make their way along its winding path, turn a corner, and are rewarded with the wondrous site of its floating mountains. A prominent feature of the Avatar movies, the filmmakers have the benefit of computer-generated imagery to create the otherworldly elements. At Disney World, however, the floating mountains are a feat of ingenuity and engineering. From a distance, you can appreciate their scale and majesty. Up close (in order to get to Avatar Flight of Passage, guests have to walk under the floating mountains), you can marvel at the waterfalls that cascade off of them, the plants that grow on them, and other attributes. It would be a mistake to race through Pandora's two attractions and not take the time to explore and appreciate its incredible detail. Listen for the animals that are scampering in the brush alongside the trails and hear their peculiar mating calls. Wonder at the strange things growing in the land, which are a combination of real plants melded with items crafted by the Imagineers. The immersive land has been carefully designed to cast visitors as active participants in the story and to place them in the center of the action. Embrace the opportunity. Pandora takes on an entirely different vibe at night. As in the movies, bioluminescent plants shimmer and create an enchanting atmosphere. There are a wide variety of flowers, trees, and other flora that bathe visitors in an ethereal glow. Even the ground sparkles. It would be a mistake to only go to the land at night. You’d miss a lot of the detail that is only visible during the day. But it would also be a mistake to not visit Pandora at night. Plan your day(s) at Disney’s Animal Kingdom so that you could see the land both before and after dusk. Burgers and fries just wouldn’t cut it with the nature-loving Na’vi people. In keeping with the theme of the land, the food served at the Satu’li Canteen features healthy grain bowls and bao buns. The yummy dishes are of this world but nonetheless seem exotic. Presented as shiny blue, yellow, and white concentric orbs, a blueberry cream cheese mousse dessert is especially alien in appearance. Likewise the drinks available at the land’s Pongu Pongu stand seem to be out of this world (literally). A Mo’ara Margarita takes the Mexican standard and enhances it with juicy boba balls. The non-alcoholic drink known as a Night Blossom mysteriously glows in harmony with the bioluminescent plants. The Avatar films show that all living things are interconnected on Pandora. The deforestation conducted by the evil Earth-based mining company, for example, directly threatens the Na’vi people. When visitors enter Disney’s Valley of Mo’ara, one of the first things they encounter is a giant pod-like plant. To demonstrate the interconnectivity of the land, guests can interact with the plant by touching it. The plant responds by glowing and emitting a puff of vapor. There is a native drum circle that is also interactive. Visitors can tap a beat, and the drums will respond. At night, the music is accompanied by lights. This is a bit of a cheat. Tiffins is not in Pandora, but is located just outside the land. The extraordinary, high-end restaurant redefines in-park dining and is worth considering as a special treat during your Disney World visit. Tasty dishes include Wagyu Strip Loin and Braised Short Rib. The restaurant’s Nomad Lounge offers small plate items and an extensive wine and beer list representing Africa, Asia, and South America. Patrons seated outdoors can watch the hordes of guests making their way to and from Pandora. You Know Disney World’s Fantasyland. Now See New Fantasyland.